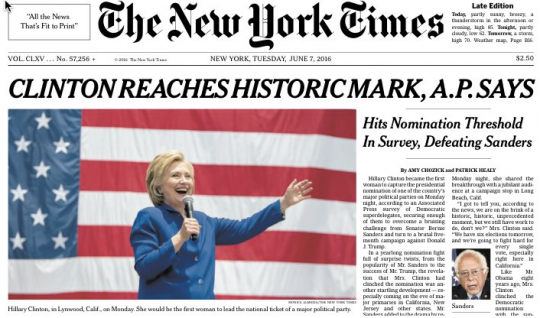 LAST NIGHT, the Associated Press -- on a day when nobody voted -- surprised everyone by abruptly declaring the Democratic Party primary over and Hillary Clinton the victor. The decree, issued the night before the California primary in which polls show Clinton and Bernie Sanders in a very close race, was based on the media organization's survey of "superdelegates": the Democratic Party's 720 insiders, corporate donors, and officials whose votes for the presidential nominee count the same as the actually elected delegates. AP claims that superdelegates who had not previously announced their intentions privately told AP reporters that they intend to vote for Clinton, bringing her over the threshold. AP is concealing the identity of the decisive superdelegates who said this. Although the Sanders campaign rejected the validity of AP's declaration -- on the ground that the superdelegates do not vote until the convention and he intends to try to persuade them to vote for him -- most major media outlets followed the projection and declared Clinton the winner. This is the perfect symbolic ending to the Democratic Party primary: The nomination is consecrated by a media organization, on a day when nobody voted, based on secret discussions with anonymous establishment insiders and donors whose identities the media organization -- incredibly -- conceals. The decisive edifice of superdelegates is itself anti-democratic and inherently corrupt: designed to prevent actual voters from making choices that the party establishment dislikes. But for a party run by insiders and funded by corporate interests, it's only fitting that its nomination process ends with such an ignominious, awkward, and undemocratic sputter. Go to The Internet to read the rest of this article.